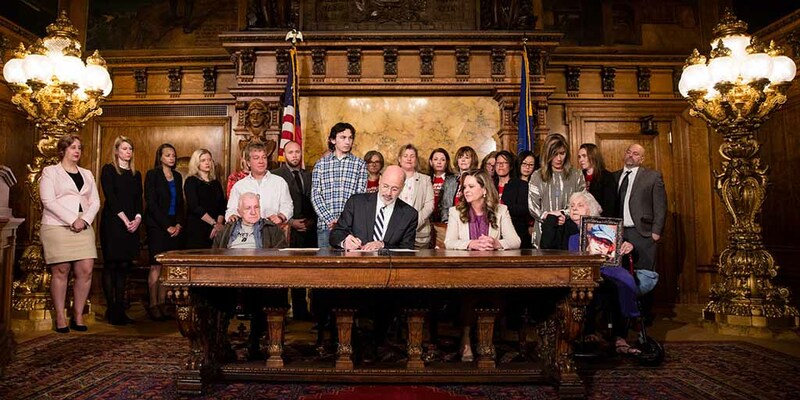 Harrisburg, PA – Governor Tom Wolf today signed Senate Bill 449, known as Tierne’s law, strengthening protections for victims of domestic violence, and urged the House to pass a package of Senate domestic violence reform bills. The governor was joined by Tierne’s Law sponsor Senator Camera Bartolotta, Pennsylvania’s Victim Advocate Jennifer Storm, legislators, stakeholders, and members of Tierne’s family. Tierne Ewing, a victim of domestic violence, was murdered by her estranged husband in 2016 after he had been arrested for domestic abuse, then released. “We all know the tragic story that led us to take a hard look at our laws, and make this change,” Governor Wolf said. “We mourn Tierne’s loss with her family, and while we can never fix what they’ve had to go through, Tierne’s law will help us prevent senseless and horrible situations like this one from happening to more Pennsylvania families, and will hold perpetrators of domestic violence and abuse accountable for their heinous crimes. “But there is more to be done, so I urge the House to pass a package of domestic bills, which were approved overwhelmingly in the Senate, including Senate Bill 501, which would fix an arcane law that allows domestic abusers to have access to guns. We know that many domestic abusers use firearms to harm their victims, as was the case with Tierne, who died from a gunshot wound inflicted by her abuser spouse. Tierne’s Law allows judges to use risk assessment tools to determine whether the perpetrators of domestic violence pose a continued danger to their victims and provides additional avenues for judges to use these tools when setting bail amounts in domestic abuse cases. Additionally, the law adds strangulation to the list of offenses for which police officers can arrest a perpetrator without a warrant when this offense has been committed against a family member or someone sharing their household. In addition to signing Tierne’s Law and urging passage of additional domestic violence bills, Governor Wolf recently gave his support for Marsy’s Law to help crime victims, and made a call-to-action for criminal justice reforms that will enhance the efforts of Tierne’s Law by recommending adoption of a single assessment tool model to be used from pretrial until parole completion, and ensuring a correlation between length of probation and risk in order to structure probation lengths that result in better supervision.